The author backed the Kickstarter campaign with $10. Kickstarter as a crowd funding company has been around since 2009, but it wasn’t until 2012 when Double Fine launched the campaign for their adventure game that many gamers around the globe found out about this concept of fan-funded games. Following its success, many companies wanted to ride the same hype train of nostalgia by presenting similar projects inspired on games of the past. In 2013, Mighty No. 9 broke records by being one of the most funded campaigns on Kickstarter, only to became one of the worst received games when it launched (I’m a backer, I have the right to say it!). But that same year, a small team that wanted to create a game in the same spirit of Super Mario 64 also launched their campaign. And yes, that’s A Hat in Time, the game that I will be reviewing in the next few paragraphs. While not fully explained in the game, our protagonist is the guardian of a lot of small hourglasses that have the power to control time called timepieces. Unfortunately, a member of a local mafia finds our protagonist’s ship floating in space, so he demands tribute to be paid to them. This leads to the timepieces falling to the earth. Now our dear protagonist will have to find them while exploring different places in this world, making new friends, but most of all, making new enemies. While we never hear her name, the developers have referred to the protagonist as Hat Kid, so that’s what I will be calling her throughout the rest of the review. She is a silent protagonist, but that doesn’t stop her from having a great personality and making you care about her. 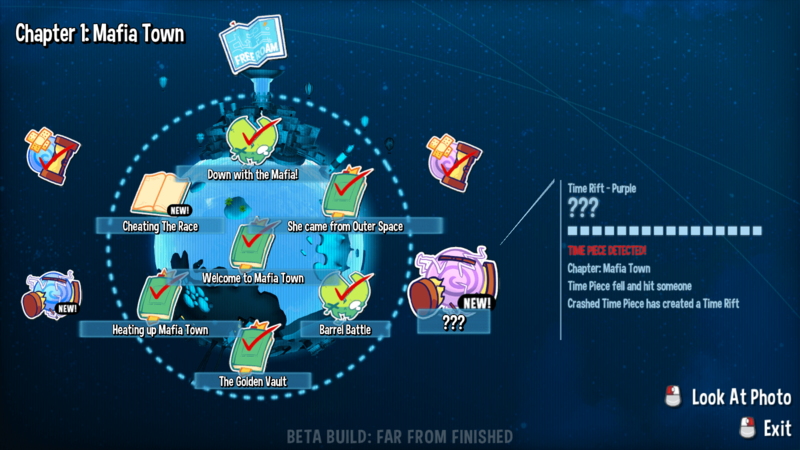 The starting point of the plot is simple, just collect all the timepieces to finish the game. But these are divided among 4 different worlds, each with its own sub plot, such as working for an evil spirit in the underworld, or assisting two directors in completing their best film. All character interactions are fully voiced, and these voices actually help with setting the tone of the game. It gives me the same vibe that Saturday morning cartoons gave me as a kid. Just enjoy the silliness, have fun and don’t think much about it. 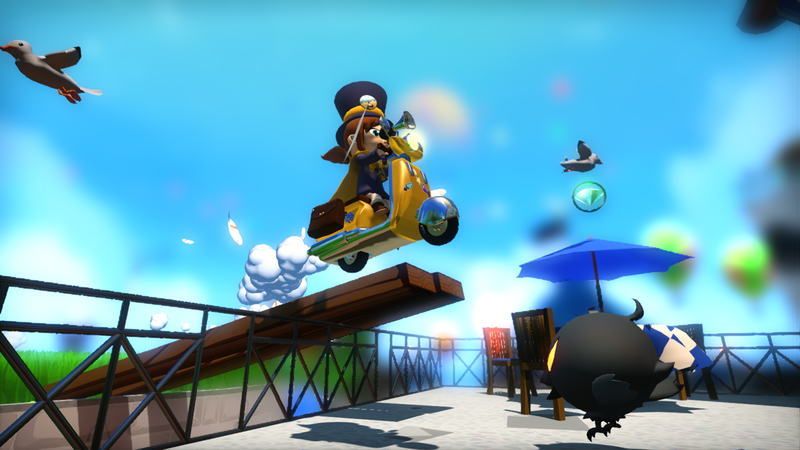 As I mentioned above, the game takes inspiration from 3D platform games like Super Mario 64 and Super Mario Sunshine. 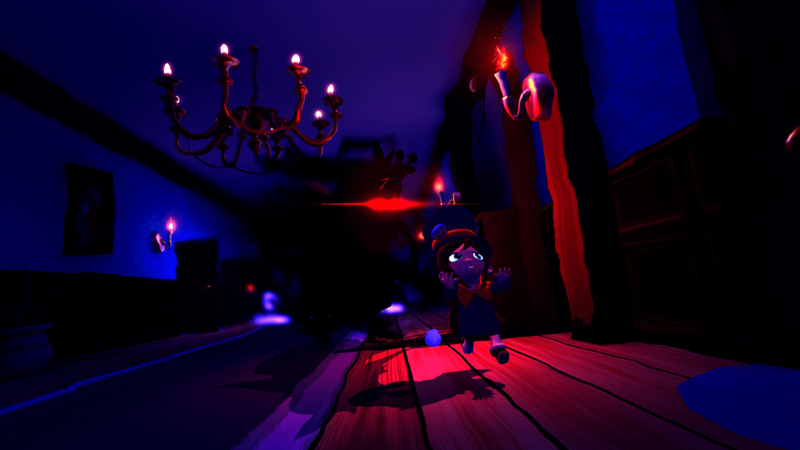 You have a main hub, Hat Kid’s ship that you can explore, and on certain rooms there are portals to each of the game’s worlds. Each world consists of a main area that you will have to visit several times to find each of the timepieces, but each visit will be different. To give you an example, on the first level, Mafia Town, you will visit it at daylight, on a rainy night, and while filled with lava. All these visits starts on a different part of Mafia Town so at first you may not notice that you’re on the same city you were before. 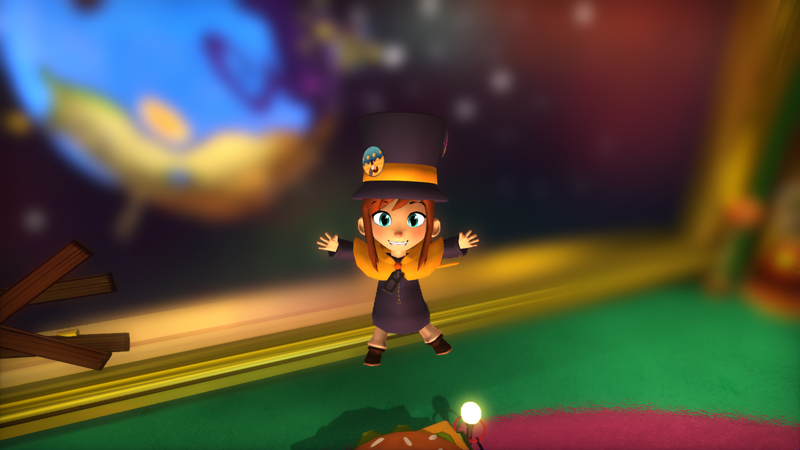 As you can expect from a 3D platformer, Hat Kid can jump, double jump, dive to jump farther, and wall jump, all very basic skills for this type of game. But you will also find balls of yarn during the game that will unlock different Hats that you can equip at any time that will grant you new abilities. Running, throwing explosives and turning into a block of ice are some of the first abilities that you will unlock, and these are needed to reach new areas and find new collectibles. Along with the yarn balls needed to unlock new hats you can also find relics that can be arranged to decorate your home, coins that can be used to unlock color palettes and customization options, and the game’s currency which is used to buy badges that can be equipped to provide new abilities to Hat Kid. The badges grant abilities that can be required to progress through the game like a grappling hook, or optional skills, like a laser beam to attack or a Vespa to increase your speed to traverse the levels. At the end of each world there is a boss waiting for you to test your skills, and the bosses in this game are great. The point of a good boss in a game is to test the mechanics that the game has been teaching you and see how well you can use them. This is the approach that A Hat In Time uses. The bosses are not particularly hard, but you can see how many of the elements that were part of each area are used as part of the fights. One example is on the second world. One area has you moving quickly through the map while being followed by a group of enemies that copy your every move. During the boss fight of that world you will have to fight it under the same condition for a while. The bosses will also require precise jumping and pattern recognition, but are very forgiving and constantly give you extra health, so it’s never unfair. But the most fun you can have in this game is simply exploring the maps while trying to find all the different collectibles. It took me 18 hours to complete the game at 100% and I really enjoyed every part of it. The game controls exactly as you expect it to and all the different levels are varied and unique. I don’t think they are reinventing the wheel in regards to 3D platforming, but everything that was done here was so good that I don’t have anything to complain about. From a graphical standpoint the games looks really good. It’s easy to get immersed in the game thanks to the cartoonish style for all the characters in this colorful world. The character designs are simple, but go in line with the whole “Saturday morning cartoon” feel that I mentioned above. The music is very catchy and cheerful with the use of different instruments like flutes and keyboard along with other string instruments. There is a good variety of songs and alternative tracks that can be unlocked as well. In conclusion, A Hat in Time manages to keep the promise that it made 4 years ago to present a game that’s a tribute to 3D platformers, while creating a new and unique game as well and not simply copying what was already in place. October is already packed with the release of Cuphead and Mario Odyssey but I’ll recommend you check this one out as well, it’s more than worth the $30 asking price for it, and who knows when we’ll get to enjoy another great platformer.